The last week of early voting -- and the last week before the election -- is upon us. As of Sunday, Oct. 26 over 7.6 million people have voted. If past patterns hold true, the number of voters will ramp up at an increasing rate as we enter the final stretch into Election Day. I track early voting statistics here. There are two reasons for the jump in the number of early voters from a week ago, when I reported 1.9 million people had voted. First, states such as Georgia, Florida, and North Carolina that had been reporting primarily mail ballots began offering in-person early voting. In-person early voting is usually the voting method of choice for most early voters in states that offer both mail and in-person voting. Even with more in-person voting this week, the share of in-person among all early votes jumped to 79 percent in Georgia and 91 percent in North Carolina. Florida has a heavy use of mail ballots, but even there, over 400,000 people voted in-person early this week. Second, more states began reporting early voting statistics as their early voting ramped up, states such as Arkansas, California, Colorado, Louisiana, Maryland, Nevada, Oregon, Texas, and Washington. All of these states had to under federal law, at least, send out mail ballots to military and overseas civilians in September. More recently they either sent out mail ballots or started their in-person early voting period. In-person early voting is the voting method of choice for Democrats. Predictably, when the in-person early voting period started in states with dual methods of early voting, the partisan composition of the electorate shifted in the Democrats' direction. I expect when the Monday numbers are available in states with high minority populations, we'll see the numbers shift even more in the Democratic direction as they reap the benefits of the "Souls to Polls" mobilization that occurs in African-American churches. While welcome news for Democrats, they traditionally tend to do well in the in-person early vote, so these numbers are not indicative of an imminent Democratic wave. The strongest signal from the early vote is that there will be higher turnout in key races. I cautioned previously, one should not project national polls' relative enthusiasm -- or, related, party preference among likely voters -- onto these races since we will likely see lower turnout elsewhere, especially in the large Democratic states without any Senate elections or competitive Gubernatorial elections. In the key competitive Senate and Gubernatorial races the early vote confirms the polls that the election is close. We still have a critical week to go of voter mobilization, which may give us a better picture of where the election stands. Perhaps we will get the strongest read from Colorado's all-mail ballot election, but even there the signal will be difficult to interpret since this is the state's first such election. A statistic of importance in the coming week will be outstanding ballots, those that have been requested by potential voters but have not been returned, especially in states like Colorado, Florida and Iowa that have a large number of outstanding ballots. Election officials report all their ballot tracking to campaigns, so they know who has been naughty and nice. With such narrow margins, every vote is precious to the campaigns. Both parties will be contacting their identified supporters with ballots still in hand to remind them to finish what they started. Iowa's race for early votes has been neck-and-neck. Traditionally, Democrats lead Iowa's early votes through superior voter mobilization organization; in 2010 registered Democrats had a 5.7 point advantage over Republicans in returned ballots. On Wednesday, Republican's touted their narrow 363 ballot lead over Democrats, their first time in recent elections to lead so late in the cycle. Republicans were lifted above Democrats by a mail ballot drive targeting registered Republicans that outpaced Democrats' new ballot requests for the previous two weeks. For the past week, it was Democrats turn to run an absentee ballot drive, and the Democrats took the lead in new ballot requests. With new Democratic ballots in the pipeline, Republicans' lead was short-lived. Just one day later, on Thursday Democrats regained the lead by 463 ballots. Remarkably, this is a lead out of 292,921 total ballots returned. Democrats' lead may expand in the coming week as they lead the 161,122 outstanding ballots 43 percent to 30 percent. There is uncertainty to Democrats expanding their lead on two accounts. First, Iowa also opens temporary satellite in-person voting locations, sometimes for a single day at the request of voters, that are counting along with the mail ballots. It may be that the Republican cast in-person ballots this week. That's not the pattern elsewhere, but Iowa's in-person turnout is heavily contingent on where election officials locate these polling locations. Second -- and what may concern Democrats the most -- is that Democrats may be more likely to leave their votes on the table. In 2010, 49,780 mail ballots were sent by election officials to voters, but were never returned. Of these, Democrats were 46 percent while Republicans were 27 percent. Iowa's early vote appears to be easily on pace to exceed 2010, and in raw terms will likely set a record for a midterm election. That's not a surprise since the state did not have competitive statewide race 2010. The change in competition and Republicans' mobilization efforts make it difficult to interpret the early voting statistics. The most prudent assessment is that turnout will be high, and the election will be close. North Carolina's in-person early voting got off to a strong start on Thursday. As of Saturday, 313,729 people had voted; of these 284,510 or 91 percent were in-person early votes. Democrats now hold a commanding 48 percent to 32 percent lead in all early votes, a lead that is unlikely to fade between now and Election Day. Democrats have been most worried about the legislature's reduction in the early voting period by one week. However, there are expanded evening and weekend hours and more polling locations open during this reduced early voting period, such that there are 97 percent of the hours being offered compared to 2010 despite the reduction in days. Early voting tends to increase as the election nears; this is already evident in the states reporting their numbers this cycle. The North Carolina changes may make early voting more convenient at a time when more people are interested in voting. In the three days of North Carolina early voting so far, 284,510 people have voted in-person. At the same comparable time in 2010, with an extra week of in-person early voting, 339,320 votes had been cast. Democrats can be encouraged that they have made up for the deficit of in-person early voting days so quickly, but there is still some time to go before the end of the early voting period. The composition of the early vote compared to the same point in 2010 is also more favorable to the Democrats. At this same point in 2010 -- two Saturdays before Election Day -- registered Democrats led the early vote 44 percent to 38 percent. In 2014, they lead 48 percent to 32 percent. Early voting accounts for some of the difference, as Democrats led 2010 45 percent to 37 percent and led this year 49 percent to 30 percent. But that is not the whole tale; Democrats are also doing better among mail ballots returned. In 2010 Republicans led the 25,648 mail ballots 47 percent to 34 percent; in 2014 Republicans lead the 29,219 mail ballots returned 43 percent to 34 percent. The slightly higher volume of mail ballots, and slightly better performance of Democrats and persons with a party registration may be indicative of greater interest among Democrats, but may also be indicative of the Democrats encouraging some of their supporters to vote a mail ballot in anticipation of the reduced in-person early voting days. 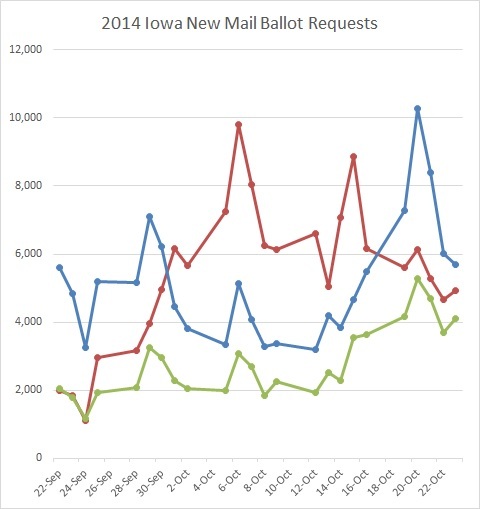 Republicans recently overtook Democrats in new mail ballot requests. Here, Republicans have their work cut out for them. Among the 55,838 outstanding mail ballots, Republicans lead Democrats 46 percent to 30 percent. One way by which Republicans can put a finger in the dyke against the flood of Democratic in-person votes is to chase down these Republicans who have yet to return their mail ballots. With early voting still slightly down from 2010 in raw numbers, we'll have to sit tight to later in the week to see if the expanded polling site hours will allow the levels to reach 2010. In Georgia, 383,801 persons cast ballots as of Friday (there is no weekend reporting in Georgia). In-person early voting has been going on all week in Georgia; 303,244 or 79% of the votes cast have been in-person early. Georgia's had a higher volume of mail ballots than North Carolina, but that is at least partially because, unlike North Carolina, the state has permanent mail ballot status -- where voters are sent a ballot every election cycle -- for people with valid reasons, such as being disabled or elderly. Georgia does not have party registration, so we turn to race to get a sense of where the parties stand. I also do not have the most recent voter registration file, and I am missing registrants who registered since the November, 2012 election. That said, among those voters who I can identify by race, Whites constitute 65 percent. This is good news for Democrats, as they will likely need every one of these votes to overcome a much Whiter Election Day electorate. I am among the 1,744,378 Floridians who have voted. Republicans hold a 46 percent to 37 percent lead over Democrats, but that lead has been steadily eroding for the past several days. Republicans have a strong position because most of the votes cast so far, 1,344,716 or 77 percent, are mail ballots. The number of mail ballots is almost double the number of 2010, which was 735,613. Republicans led mail ballots in 2010 by 52 percent to 34 percent; this year the Republican lead is narrower at 47 percent to 36 percent. Part of the reason for the narrowed lead -- and the heavier usage -- of mail ballots is that in state implemented a new law in 2012 that allows voters who voted a mail ballot in 2012 to automatically receive one in 2014. Since the Obama campaign placed a special emphasis on mail balloting, reducing a 14 Republican advantage among mail ballots in 2008 to a 4 point advantage in 2012, more Democrats have mail ballots and are casting them. One reason for the recent movement towards Democrats in the total early vote is that Democrats are returning their mail ballots later than Republicans. On Saturday, Democrats led the 52,971 new returned mail ballots by 41.3 percent to 40.7 percent. Democrats lead the 1,224,653 outstanding mail ballots even more -- 42 percent to 36 percent -- and it will be crucial to the Crist campaign to encourage these voters to return their ballots. Democrats began making up ground on Republicans once in-person early voting started this week, too. So far, 399,748 persons have voted in-person early, compared to 1,042,759 for total in-person early voting in 2010. New in-person early votes are coming in at about 100,000 a day, and this rate may increase, so the in-person early voting may match 2010. Unlike other states, Republicans led the in-person early vote 45 percent to 40 percent in 2010; so far the parties are at near parity with Republicans leading 42.0 percent to 41.7 percent. In all, Democrats are outperforming their 2010 early voting levels, when Scott won the governor's election by a percentage point. The higher mail ballot usage as a consequence of the law change injects an unknown into the prognostications. It may be that Democrats are faring better because some of their voters who would have voted on Election Day are now voting a mail ballot. With this unknown, neither campaign should take comfort in these statistics. These are just some of the key states with early voting. More information can be found here, and on my Twitter feed.